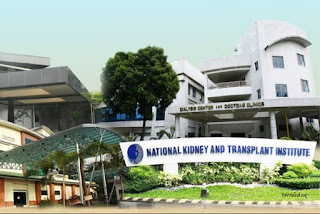 In celebration of the National Kidney Month, the National Kidney and Transplant Institute (NKTI) offers free kidney check-up for the first 100 patients for all Fridays in June. Let's spell out those Friday dates for you - June 3, 10, 17 and 24. The free check-up covers laboratory tests like cholesterol, creatinine, cystatin C, FBS (fasting blood sugar), and urinalysis. It also includes requests for general ultrasound. These free services will be given on a first come, first served basis, as announced by Health Secretary Janette L. Garin. The theme for this year's National Kidney Month celebration is "Bato Kong Alay, Bago Mong Buhay", which focuses on kidney donors. Aside from free kidney check-ups at NKTI, there are other activities lined up for the National Kidney Month like the Batong Bulilit Art Contest, community outreach services at SM North Edsa, and lectures and teleconferences focused on nephrology and organ donation. There will also be a medical mission that will be held at the ABS-CBN garden on June 26. According to NKTI, Chronic Kidney Disease stage V (CKD-V) affects about 10,800 Filipinos per year. About 9 years ago, NKTI recorded 7,109 patients with CKD V.
Meanwhile, Secretary Garin also said that the Department of Health plans to have one dialysis center for each of the 81 provinces in the country. Each center will have a budget allocation of P17 to P18 million. The dialysis center project is welcome news for Filipinos who are burdened by the prohibitive cost of dialysis in the country. A lot of dialysis patients miss or totally stop undergoing dialysis because of lack of funds.